A Saturday afternoon and my belly was having its usual constitution, grumbling and complaining about not having been fed after a mere two hours had passed. I was in Oak Park, Illinois, at a spice shop looking for some flavoured cooking and baking oils. Having combed through several restaurants in the Oak Park neighbourhood, I had found myself traipsing down Madison Avenue in Forest Park. Plenty of pubs in the area to leave the Irish with options for quenching their thirsts. 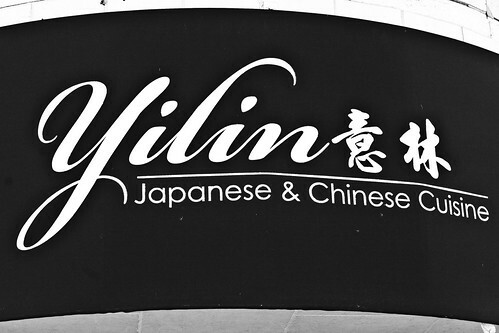 At the far west end of the Madison Avenue stretch of eateries at 7600 W. Madison Street, there is Yilin Japanese and Chinese restaurant. Oh how I love Pan-Asian. The inside of the restaurant is reminiscent of a ski cottage with the wood and dark facing to everything. All you need is a fireplace, a mug of hot cocoa, and someone sitting by the fire with his or her leg in a cast. (Pause) Okay, that may be a bit too exaggerated. The customer service is top, and you can tell when smiles and statements of welcome are painful to hosts and hostesses, not the case here. There was a hint that English was indeed a second language and recently learned. While my Japanese is a bit more conversational than I may let on, I knew the slant to the eyes was Chinese, not Japanese. But the most common acknowledgement of a smile was more than enough to let me know that my business was important and that I was going to receive the best. I was off to a good start. First to the table was complimentary edamame. As much as people enjoy a cup of those beans, it may have been shelling peas with my grandmother as a child that makes me grimace whenever a cup of edamame is placed before me. 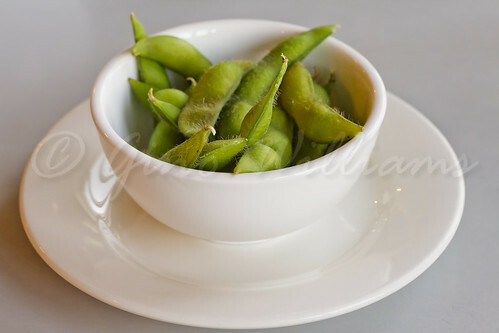 Thankful that these were not powdered with salt, I partook of the edamame to completion. 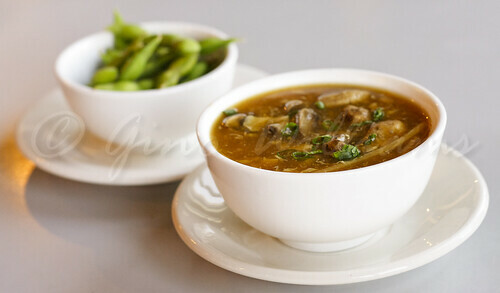 Then there was a warm cup of hot and sour soup. Loved it. It has been years since I had hot and sour soup, having sworn off any restaurant Chinese food after having had some of the best authentic Chinese food prepared at the hands of my first post-college roommate’s parents. Where it all got to be pedestrian was with the sweet and spicy shrimp. This was certainly a dish that I would have enjoyed more had I never been served “real” Chinese food. Thank you, Mr. and Mrs. Cheung, for preparing so much delicious Chinese food with real flavour that blew my mind, because the food that I have at any Chinese restaurant has as much zest as a boiled egg without salt. 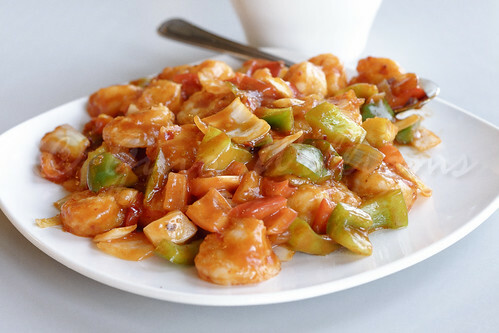 I devoured the plump sweet and spicy shrimp with a bowl of rice. I will not let food go to waste. 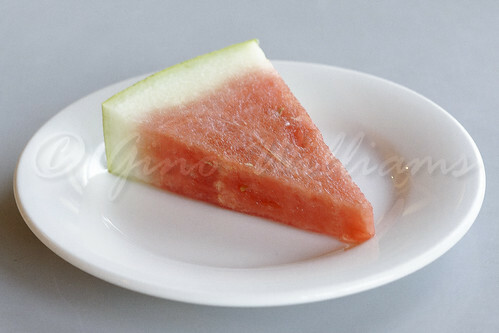 And the complimentary slice of watermelon at the end of the meal was too cute for its own good. Usually there is a sweet for the palate. Who would have thought of a natural sweet instead? The customer service is really fantastic, an indication being the manager asking me if everything was okay. I don’t recall the same attention given to other patrons. Then again, I was enraptured with the meal before me. It may have been because I had my high-end camera out photographing the meal. High-end camera at any restaurant no doubt could mean the photographer is a visual agent for a magazine or editorial. I appreciate the customer service because that is one magnet that draws a person back to an establishment. However, food is the other draw and I fear that I may have been belly-washed from having had Chinese food prepared the way that it is served in China, not for the soft American palate. Perhaps next time I shall have to gather some of my Chinese friends and have them join me. Yes, I shall do that, and then see how different the flavours are in the dishes. What you won’t do for love, you do for food. Sorry, Bobby Caldwell. Short and sweet review. You know about my quibbles with Chinese restaurants around in this country especially around my area. You and I are alike in our taste when it comes down to Chinese restaurants. 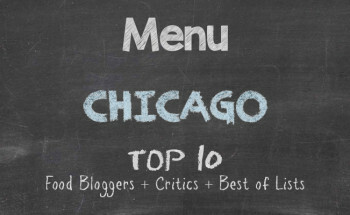 Minus the urban legends and the like, the food pales in comparison in America to the bloom in the taste in China.